I wanted a clean modern design with no wires visible so I rotated the case backside down and built a 7" tall base to set it on. The front panel comes off for access and provides a storage space. The only mod to the case was to knock out the flanges that hold the filter. I then used thin black poster board to cover the bottom vent holes before I skinned it with wood grain in vinyl. I made a I/O port shield and graphics card shroud out of the MB and Graphics Card boxes they came in. I also used black felt to close the gaps between the glass and frame. Last edited by CSinTexas; 08-14-2016, 01:26 PM. Thanks, I saw your Shiny Charizard Project it looks like it will be nice, You will be an expert water cooler by the time you finish it. I have thought about water cooling my video card because it really generates all the heat (I do not overclock my CPU) but it is very complicated and expensive to do anything that looks good. If you are looking for a balance between aesthetics and performance, you could always look into a small custom loop comprised of soft black tubing such as EK ZMT Tubing or Primochill Primoflex Onyx Black tubing and EK/Bitspower nickel/chrome fittings as that would look good with almost any build without costing too much. Otherwise I really like how you turned that In Win 303 case into a really gorgeous modern looking piece of hardware. I just think the water tubes look cool. 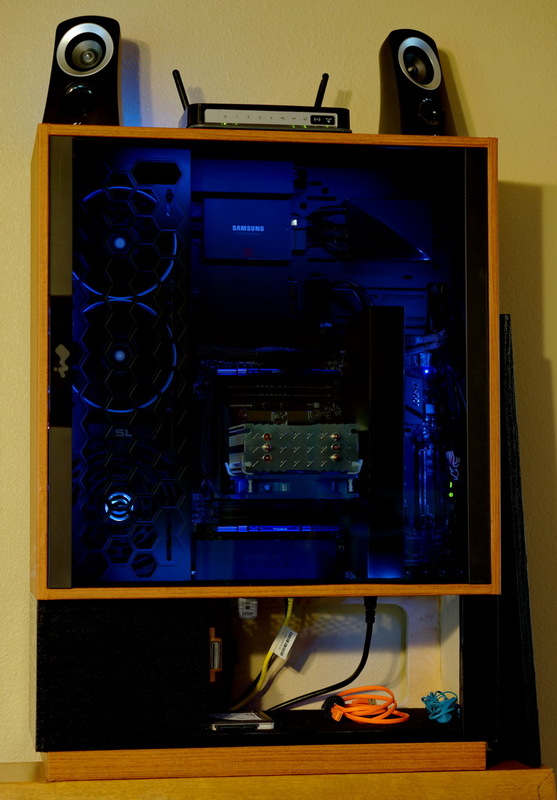 Other than the RGB lighting system I do not have much going on inside the case. I added some strips to my graphics car shroud and I/O covers. And for fun I set a binary clock that my father-in-law gave me inside the case just under the cpu fan. The whole thing sets up on top of a desk I built so it is about eye level with the top being 6'-4" so it shows off everything very well. 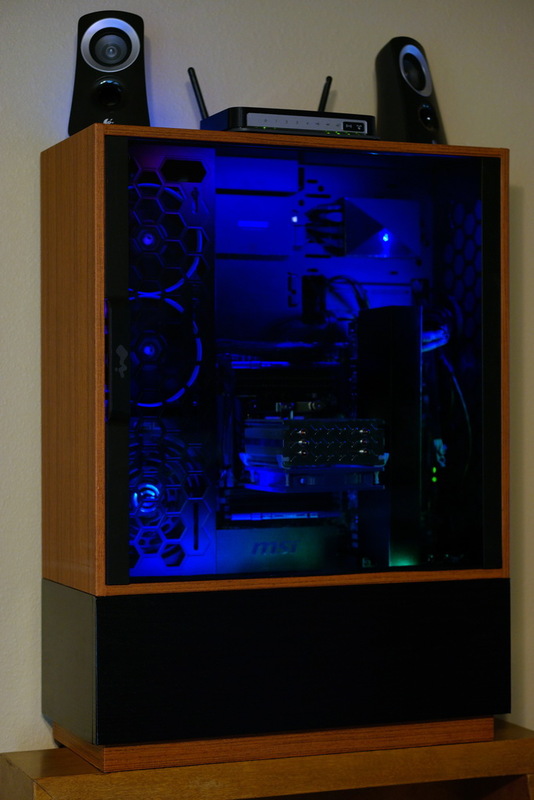 I had been looking for an easy way to do this idea for a few years but most of the cases have unattractive and non symmetric acrylic side panels. Another thing one could do with the base is use it to contain and hide a speaker system as long as the bass box was not to large and not surround sound. Last edited by CSinTexas; 08-07-2016, 04:55 PM. This is an interesting mod! I love it. 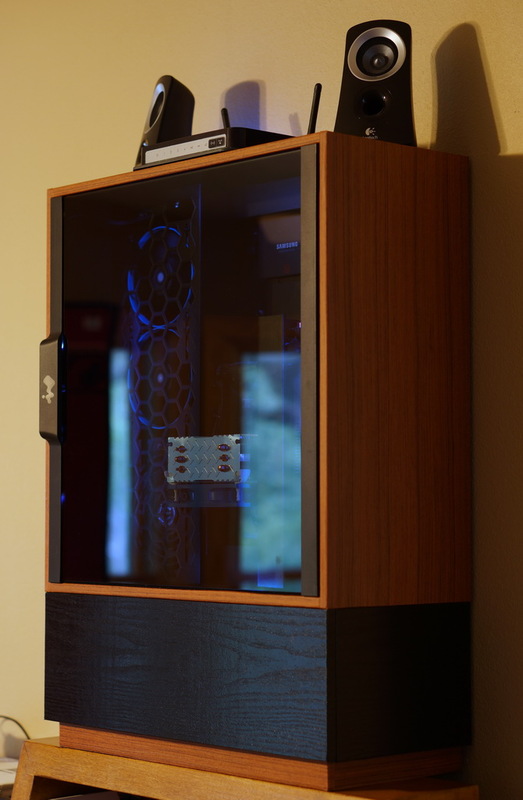 The GPU will hit 90c in a game at 2560x1440 but the case is still relatively quite even with the glass. Next I need to build a custom stand for my 32" monitor. woooo it is really nice. 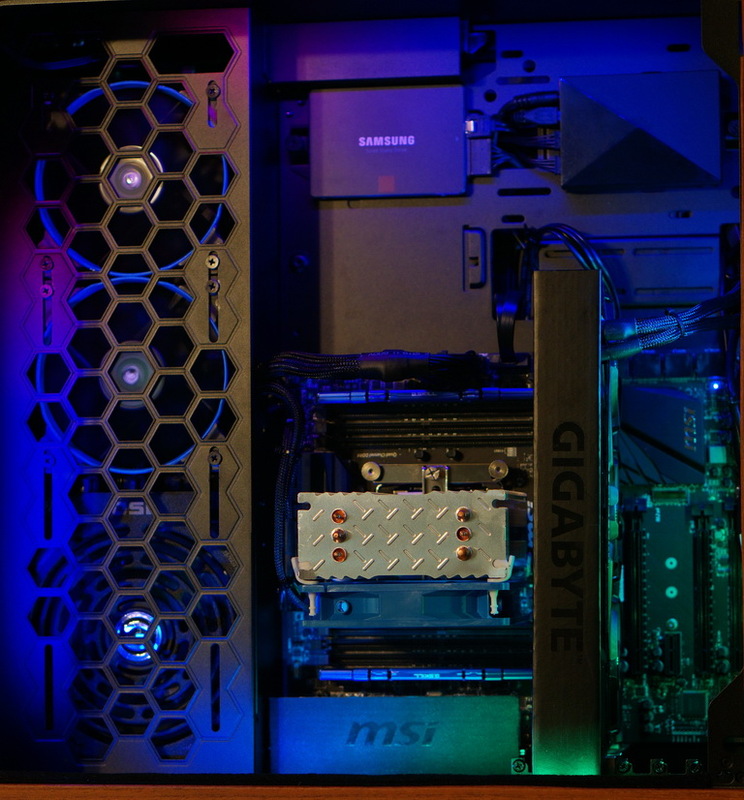 I was able to add an 80mm fan mounted at the the PCI openings and pointing up at the graphics card which did not lower the normal operating temperature much but lowered the maximum gaming temperature to about 82c which was a pretty big boost. It occurred to me that a much better air filter system could be made. If I had not built it to sit on top of my existing desk I might of made the base desk height. then used a large ac filter on the back and some double doors on the front and shelves for storage. 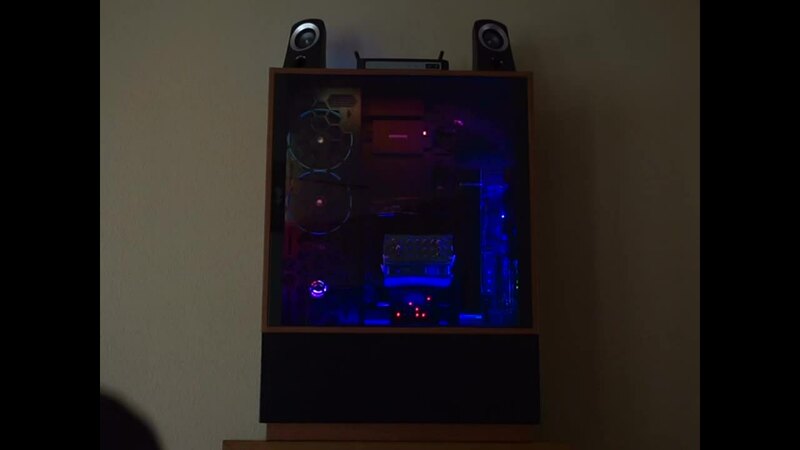 Great build!! I love the wood panel touch to make it feel like a home entertainment system.